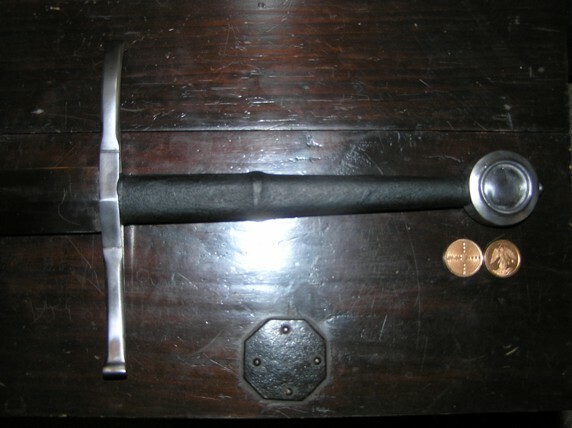 Well I decided to do a small project to enhance my new A&A Durer long sword. 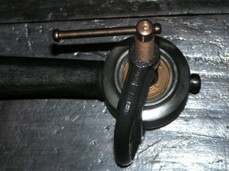 The Durer comes with a wheel pommel with a recessed depression on each side of it. After playing with it and handling it a bit I started thinking "what can I put in these recessions to make it look cooler". The thought kept coming to me every time I carried the sword this last weekend at the Golden Gate Renaissance Faire, so I looked around the faire for medallions or such that I could "mount" in these recessions. I finally stumbled upon a guy who sells stamped coins, in either Silver, Bronze or Gold-plated. I actually wear around my neck a coin that he had done a few faires ago and thought it would be cool to mount a pair of those on the pommel. I decided on a pair of Bronze coins (without the chain ring) because the Silver ones would just blend in and not contrast with the pommel's steel color, and because the Gold-plated ones would probably just wear away eventually and look bad over time. Also the Silver and Gold ones were pretty expensive for this type of project and my budget (about $45 and $60 a coin). The Bronze coin pair, complete with stamping on each side, cost me only about $30 total and in my opinion look much better. 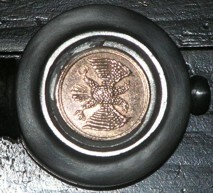 I had one stamped with a Double-Eagle and one stamped with St. Michael each on one side. My faire character is German so the Imperial Double-Eagle kind of fit, and our guild is St. Michael's Salle so I figured I couldn't lose with that either. On the reverse of each coin I chose a kind of checkered Celtic pattern. One of the other faire patrons who overheard me describing to the coin stamper what I planned to do came up with the suggestion that I use a rough back pattern since it would bond with the glue I planned to use better than a smooth back. He also gave me a glue suggestion to use for the project. After the faire I went to the hardware store, and after much looking and asking clueless sales help there, I found a glue called "JB Weld" that had been suggested for me to use. I also bought a 2" clamp to hold the coins in place for their setting period after gluing. So far the total cost of this project has been under $40.00. Well the following attached pictures show the results, materials and before and after shots. This morning I took the final pictures and gave it a workout to see how it worked out. The handling of the sword seems to be the same or better with the point of balance (or COG) about a 1/4-inch back to now 3 3/4" from the guard by my tape measurement. It's still a lively and fast sword, perhaps even livelier! 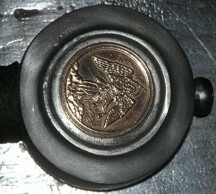 Then I polished up the coins and pommel and took my final pictures for you all to see. Finally, I am thinking of getting some good parafin wax or even some colored wax and melting it into the grooves around the coins to keep out crud and corrosion from creeping in. What do you guys think I should use? I was thinking of even using some lead to pour into the cracks around the coins, since I'm sure a lot of historical projects of this type would mount things using lead, but it has some problems too. Lead probably wouldn't look as good, it requires a lot of extra expense to get the equipment and safety equipment for using it, and I would have to do it outside. So it's out. Likewise on using Silver or Gold melted into the cracks. Too expensive and complicated. 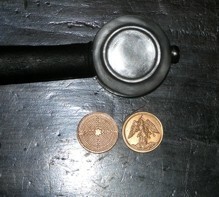 The coins and pommel before I glued them. The coins look great. To fill the gap, perhaps you could glue in a thin strip of leather, either black to match the grip, or something more colorful. My thought is that the gap is large enough that you won't really be able to hide it, so best to go for contrast.